Modern lanterns are a far cry from the unsafe gas varieties often found hanging in tents of expeditions past. Usually powered these days by LEDs, these lanterns provide a great semi-permanent light source for inside and out, whether you’re off on a weekend jaunt, at a festival, or setting up basecamp on a more extreme adventure. We’ve picked a few of our favourites camping lanterns, and as always, tried to find a balance between great quality, and great value. 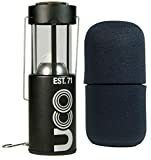 The UCO is one option that doesn’t use LEDs, making it a lovely night time light, for reading, relaxing, and really getting into the camping spirit. It’s essentially a collapsible candle holder, which holds UCO’s own specially designed candles perfectly. Up to 9 hours of burn time per UCO candle. Choose from either aluminium or brass construction on the UCO, both are hardened and super hard-wearing. Anything collapsible needs to be durable, and the UCO is sure to stand up to repeated use. Folds away into a neat foam capsule for easy transportation. The UCO is made from either brass, or anodized aluminium. Both are great for use inside and outside. There are lots of things we love about the UCO, not least is the fact that it allows you to use real candles rather than LEDs. It has the added benefit of warming your tent, and it helps to remove condensation. The Goal Zero Mini is the little brother of the bigger Goal Zero Lighthouse, although it still packs a massive punch at 210 lumen. It fits in the palm of your hand, and the legs fold in completely, making it even more portable and convenient. The Lighthouse also doubles as a charging station, and features a USB port for plugging in phones and tablets. The Lighthouse is a great piece of kit, made from a combination of lightweight plastics and steel legs. It’s light and sturdy, and as long as it doesn’t get beaten around too much, it’ll last. One of our favourite camping lanterns. The slim steel legs are foldable and surprisingly strong. The rest of the Lighthouse is made from quality plastics, making it lightweight and portable. As well as being a solid lantern, the Lighthouse doubles as a charging station. Use the built-in USB port to charge phones, Kindles and tablets, and never run out of juice when you need it most. Use your phone to turn the Princeton off and on, and enjoy 250 lumen of pure, evenly spread LED light. The Princeton is collapsible and light, and the sturdy legs fold underneath, making it even easier to pack and transport. The stackable upper portion is an attractive feature, too, and we love the Princeton as a gift option for regular overnight hikers and campers. Quality can be a difficult thing to find in collapsible, portable camping lantern, but the Princeton is both extremely well made and conveniently small. We’ve got no complaints at all about the quality of the stackable upper, or the folding legs, and the Bluetooth control seems to work well, too. Made mostly from durable plastics, the Princeton is light and rainproof, another plus for extreme outdoor enthusiasts. One of the best camping lanterns on the market today. It looks a little strange at first with its crumpled upper segment, but the Princeton is made to perform, and stacks easily and quickly. The Bluetooth control is a bit of a novelty, but if you’re in bed and don’t feel like getting up to turn off the lantern, then having the option to turn it off remotely is a thoughtful touch. The Apollo is a simple, thoughtfully built LED lantern that’s light on extra features, but superb at what it’s made for. 80 lumen of light housed inside a frosted globe, the Apollo distributes its light evenly and efficiently. The dual reflector inside the globe is responsible for distributing the light evenly, and it works nicely inside a tent, or as an ambient outdoor light. Because the Apollo is low on extras, there’s a big focus on quality. It’s made from plastic and a frosted plastic globe upper, and the legs are steel. You can either stand the Apollo on its tripod legs, or use the steel hanging handle to hang it from branches or inside your tent. Made mostly from plastic and stainless steel, the Apollo is a trusty outdoor companion, that’s lightweight, durable and weatherproof. There’s not a lot extra to say about the Apollo. It’s a simple, powerful LED lantern. It does feature folding legs, and the dual reflector system inside the frosted globe helps to distribute the light evenly, indoors and outdoors. For the price, this is one of the best collapsible lanterns we’ve seen. The TaoTronics makes a fantastic addition to your weekend camping kit, and is also great as an ultra-lightweight fishing light. The lantern collapses down to the size of a beer can, and when unfolded, features a hanging handle so you can position it wherever you like, away from the wet ground. The TaoTronics doesn’t have the same quality feel as some of the other higher-end lanterns on our list, but for the price, it’s decent enough, and it’s good to have one stashed away in your kit for emergencies. Keeping costs low, the TaoTronics is made from reasonable-quality plastic. It’s not incredible, but it does the job. One of the most cost effective camping lanterns on the market today. Folds down into itself, to around the size of a beer can. The TaoTronics is an LED lantern, so it shines brightly without any noticeable dip in brightness until the batteries are near empty. LEDs tend to perform well in extreme conditions, too, so this a good one to have as a lightweight backup on your travels.